2Mince your garlic, dice your onion, and chop your carrots and bell pepper finely. 3Heat a large saucepan over medium-high heat, then add garlic. Sauté 2 minutes until fragrant, then add diced onion. Sauté 4-5 minutes until translucent. 4Add carrots and bell peppers to pan and sauté another 8-10 minutes, stirring frequently, until carrot is fork tender. 5Drain and rinse chickpeas and add to pan. Cook 3-4 minutes longer, then remove from heat and transfer to a bowl. 7Combine all ingredients in a food processor, blender, or blender bottle. Shake/process to combine. Toss with chickpea mixture. 9Peel off romaine leaves one at a time and lay them on a plate. 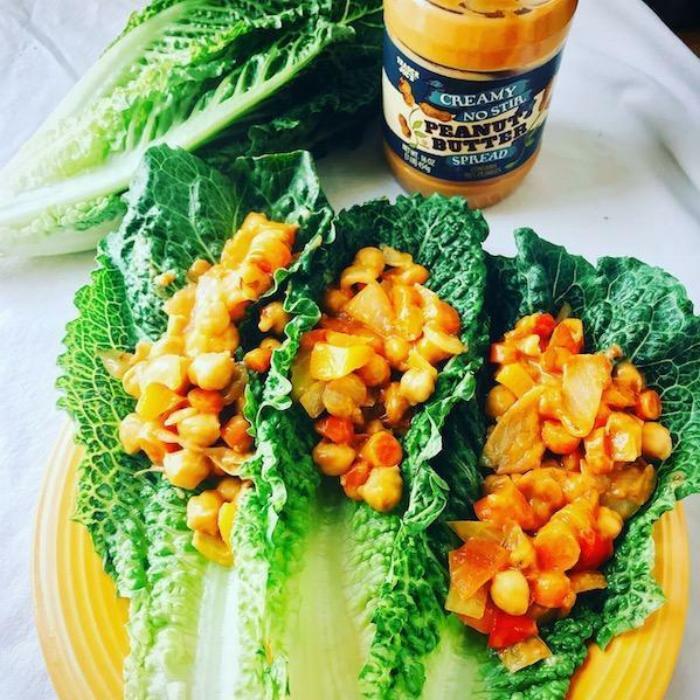 Scoop 1-2 spoonfuls of chickpea mixture onto each leaf, then wrap and eat! Feel free to switch up veggies based on whatever you have in your fridge.